currently i’m on the way to deploy a Windows Server 2008 R2 terminal server farm. One server is already up and running productive and the other is one step before going online. I work a lot of with GPO’s and user roaming profiles, to ensure to have excatly the same configuration on the new server for all users. Also i use control panel restrictions to display only neccessary .CPL’s to the user. And one special control panel addin, what is shipped with the MS Office suite ML32CFG.CPL (responsilbe for configuring MS Outlook MAPI Profile), i discovered how important it is, to ensure that applications have to be installed in the same order as on the other terminal servers. Why, you may ask….because, of the 8dot3-names (8.3) and the windows internal file/path handling. In some cases the OS calls an an application it tries to use the 8dot3 path / name. The control panel addin on the new server was registered successfully during the installation, and i could open it. But if i tried to open the CPL with my test user, what is already using the saved roaming profile, the addin would not open. Also the icon in the control panel window was different against to the other server. So what happend? 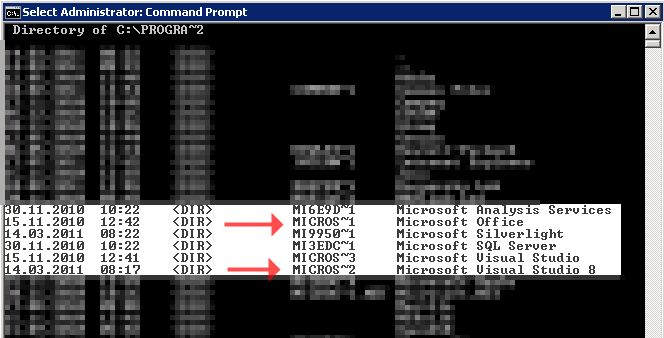 With Sysinternals Process Moinitor (PROCMON.EXE) I did a little bit research on both servers, and found out that the 8dot3 name of the MS Office path between both servers is different because i didn’t keep in mind the order, how i installed the applications on the new TS. To solve the problem, i had no chance uninstall the application what occupies the 8dot3 name, uninstall office and reinstall office and the other application again. After reinstalling MS Office suite, the right 8dot3 name was assigned tho the new installation.